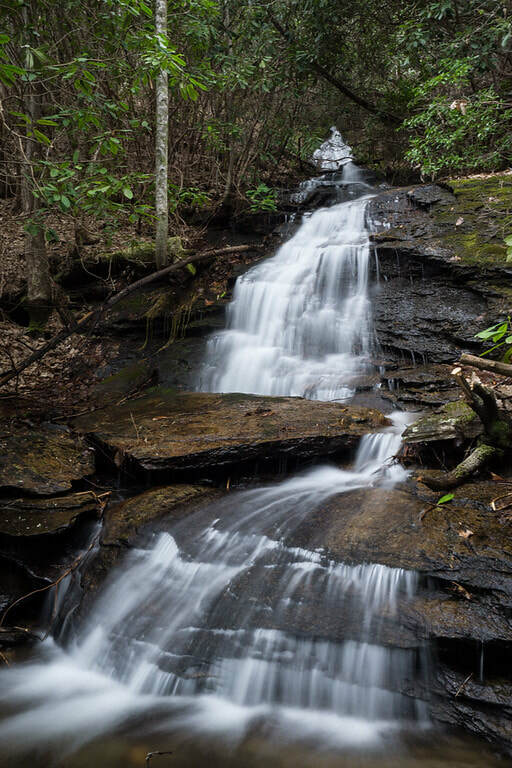 Waterfall Info: This scenic waterfall is at the start of a long series of cascades and falls on Cross Mountain Branch. In total, Cross Mountain Branch steeply drops about 350 feet down to Bob Branch. However, most of the drops are small, cluttered, and/or not scenic. The coordinates and photo are for the first drop at the top, which is the only notable waterfall on the stream. Access Info: Park on FS 292. Bushwhack upstream along Bob Branch for 0.2 miles to the Cross Mountain Branch confluence. Then, bushwhack along the north side of Cross Mountain Branch for 0.2 miles. The bushwhacking isn't easy.